The Valuing Rivers report, released on the opening day of World Water Week in Stockholm, outlines how the traditionally narrow view of rivers as primarily sources of water and power puts other critical benefits at risk, from freshwater fisheries to natural flood protection for cities and sediment flows that keep the world’s deltas above the rising seas. While these directly benefit hundreds of millions of people, they are often overlooked and remain a low priority for decision makers – until they disappear and crises occur. With rivers both in Europe and globally under growing pressure from dam development, climate change and soaring demand for water to irrigate farms and fuel hydropower plants, the report provides a new framework for improving how societies measure, value and promote rivers’ diverse benefits and offers solutions to support better decisions and management. 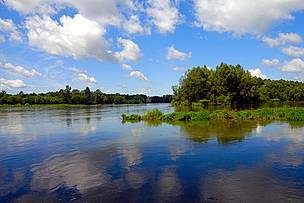 In Europe, only 40% of European surface waters are currently considered healthy (EEA, 2018), despite the EU Water Framework Directive’s legal obligation to protect and restore Europe’s freshwater bodies. “Today’s report clearly shows that healthy rivers and lakes bring often ignored benefits to people and economies, and that strong legislation is key in protecting freshwater bodies. The failure by governments to recognise the socio-economic values generated by the improvement in water status has contributed to the low ambition in reaching the objectives of the EU water law," said Martina Mlinaric, Senior Policy Officer, Water, WWF European Policy Office. "As the EU Water Framework Directive undergoes its current review, we urge the EU and its Member States to take into the account these benefits and use this opportunity to strengthen water management in Europe, rather than weaken this visionary piece of legislation. Failing this, it is people, nature and economies that will pay the ultimate price,” she added. Along with their central role in many cultures and religions, the report shows that healthy rivers, particularly free-flowing rivers, provide a range of extremely valuable – and increasingly vulnerable – benefits to people across the planet. The EU Water Framework Directive (WFD), which came into force in 2000, is one of the EU’s most progressive pieces of environmental legislation, requiring the protection, enhancement and restoration of our rivers, wetlands, lakes and coastal waters. Under Directive, EU governments have committed to ensure no deterioration and achieve good status for the vast majority of all water bodies by 2015, and at the very latest by 2027. Where implemented, the Water Framework Directive has proved to be effective in achieving its goals of good water status and non-deterioration, successfully balancing environmental, social and economic requirements. The Water Framework Directive is currently undergoing its standard review in the form of a ‘fitness check’ to assess its relevance, effectiveness, efficiency, coherence and EU added value. This will include a stakeholder consultation and a public consultation, which is expected to be launched in September 2018.